BOS, Harrisburg Kennel Club, Judge: Mr. William Cunningham, 2 GCH pts. SEL, North Country Kennel Club, Judge: Mrs. Beth Speich, 1 GCH pt. BOS, Finger Lakes Kennel Club, Judge: Mr. Joe Tacker, 1 GCH pt. BOS, Onondaga Kennel Club, Judge: Mr. Jeffrey Pepper, 1 GCH pt. BOS, Central New York Kennel Club, Judge: Ms. Sandra Anderson, 1 GCH pt. SEL, Durham Kennel Club, Judge: Mr. James Reynolds, 3 GCH pts. BOS, Cary Kennel Club, Judge: Mr. Ronald Menaker, 3 GCH pts. BOS, Delaware County Kennel Club, Judge: Mr. Jerry Clark, 1 GCH pt. BOS, York Kennel Club, Judge: Mrs. Carol Esterkin, 1 GCH pt. BOS, Lancaster Kennel Club, Judge: Mr. LaMar Mathis, 1 GCH pt. BOS, York Kennel Club, Judge: Ms. Theresa Hundt, 1 GCH pt. 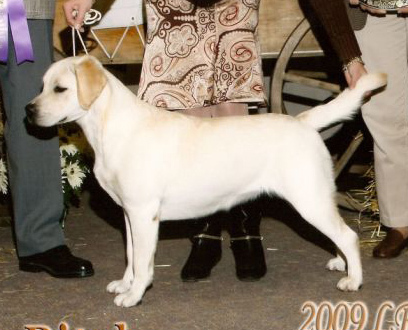 SEL, Detroit Kennel Club, Judge: Mrs. Jeannette McGinnis, 2 GCH pts. BOB, Detroit Kennel Club, Judge: Mr. James Covey, 4 GCH pts. SEL, International Kennel Club of Chicago, Judge: Mr. Arley D. Hussin, 3 GCH pts. BOB, BOW, WB, International Kennel Club of Chicago, Judge: Mr. Carl Gene Liepmann, 4 pts. BOW, WB. Blackhawk Kennel Club, Judge: Mr. Colin Hamilton, 3 pts. WB, Lorain County Kennel Club, Judge: Mrs. Judy Goodin, 3 pts. 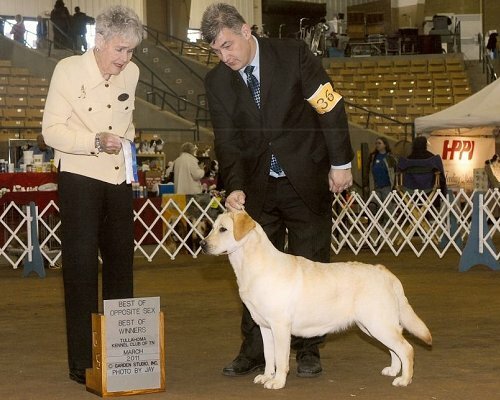 WB, BOW, BOS, Central New York Kennel Club, Judge: Mrs. Rosemary Shoreman, 1 pt.